MS 118 students play a game of chess during the after-school programs called College Town, now in its fourth year. Photo by Enid Alvarez. The New York Daily News ran an interesting article on federal budget cuts for after-school programs. This program apparently providing resources for five schools in the Bronx and all are being forced to close their programs. A total of 118 after-school programs are being affected. One of the five schools in Bronx (MS 118), a school which runs a chess program. "The effect is going to be dramatic," said David Neering, principal at Middle School 206 in Morris Heights. "We serve them dinner, there's tutoring, we run an athletic program, we have an arts program, there's a chess club." In addition, there are video and robotics courses at a nearby college. In the past, there have beenother programs that have been cut as chess still struggles to find sustainable resources for the long-term. This has been an ongoing problem in chess development. Maurice Ashley's after-school program was cut in Harlem after Harlem Educational Activity Fund (HEAF) cut funding. Ashley had organized a successful chess program and held several outdoor chess festivals in Harlem. A couple of years ago, Chess-in-Schools programs in New York were also victims of budget cuts which meant it had to cut staff. Many companies believe an affiliation with chess improves their social responsibility cachet, but these programs are only earmarked for a short period of time on a "trial" basis. After-school programs have kept hundreds of elementary and middle-school children from veering into less constructive activities. There must be more community involvement to support the activities of youth today. State funds and corporate donors are not a sustainable solution. What does this mean? It means that talented youth may forgo programs which are designed to provide an environment for constructive activities. Dijon Dowd, 13, stated, "It's wrong, nobody should cut the program. Since I started this program, I stopped failing my classes." 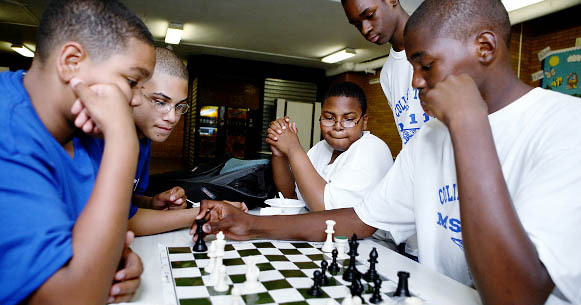 Until the chess community finds other avenues for funding, these cuts will continue to adversely affect chess development among inner-city youth. Read Jess Wisloski's, "Funds run out for after-school programs," NY Daily News, 12 June 2007. Read David Gonzalez's, "A Crash Course in Budget Shortfalls for After-School Students," New York Times, 18 June 2007.